Do you have large trees and their branches that are blocking your ocean or mountain views? Depending on your location and any covenants that might exist for your property you may or may not be able to remove those trees. If you are looking to enhance the views on your property then you need advice from a tree professional. 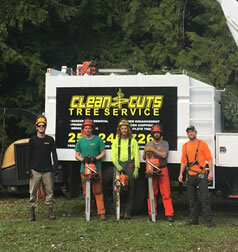 Clean Cuts Tree Service Ltd. is a tree service company based out of Qualicum Beach and serving customers throughout Parksville, Nanoose, Coombs, and Errington. We specialize in the strategic removal or topping/trimming of trees to enhance ocean and mountain views for property owners. Many of the properties in our area with beautiful views that are being blocked by trees are also on steep or sloping ground which can make view enhancement more difficult. Our crews are all skilled climbers, using proper safety equipment and techniques so we have no problem working on these types of properties. Why Choose Clean Cuts Tree Service Ltd. To Enhance Your View? When you choose to work with Clean Cuts Tree Service Ltd. for your view enhancement project in the Central Vancouver Island area you’re choosing to work with a team of skilled professionals. As professionals with over 20 years experience, we understand trees like nobody else and we can help you improve the million dollar view on your property if it’s being blocked by large, mature trees. We’ll be able to address your tree problems and come up with a viable solution that will work for you. Our crews are professional, courteous, very knowledgeable and will leave your property in a better-looking state than when we’ve found it. We clean up after ourselves so aside from your beautiful new view, you’ll never know we were ever on your property. If you’d like to receive an estimate from Clean Cuts Tree Service Ltd. for your view enhancement project please give us a call 250-240-7268 or fill out our contact form and we’ll get right back to you.